"An old friend of mine, famous tequila maker, made this margarita for me. I like it because the fresh juice makes me feel healthy, while the tequila makes my spirit feel better. The agave honey is a delicious alternative to sugar, which makes this margarita even better!" 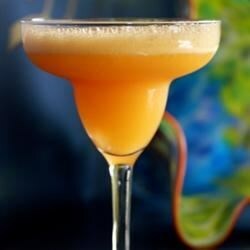 Blend the tangerine juice, ice, tequila, and agave nectar in a blender until the ice is thoroughly crushed. Dispense into 2 margarita glasses to serve. Watch how to make these 5-star margaritas. Made original which was just okay, very weak. Added triple sec, lime juice and more ice and it turned out much better! Something was missing from this recipe. I think it needs to be made a little richer with some Grand Marnier perhaps.